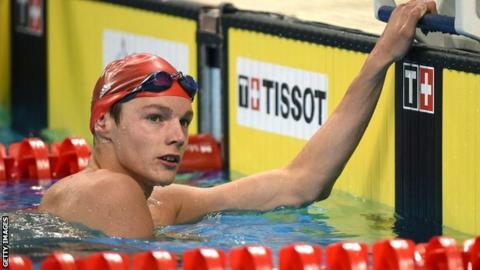 Duncan Scott set a new Scottish record to win bronze in the 100m freestyle at the European Short Course Championships. The 20-year-old clocked 46.64 seconds to finish behind Italy's Luca Dotto, and Pieter Timmers of Belgium. Scott, who won two relay silvers at the Rio Olympics last year, also finished third in the 200m freestyle event in Copenhagen. He also won relay gold and silver at this year's World Championships.